Use this site as a news clearinghouse and as a source for material to share with undecided voters. The articles and videos in the left column are chosen for broad appeal and to counter misinformation. Let's take back the vote! 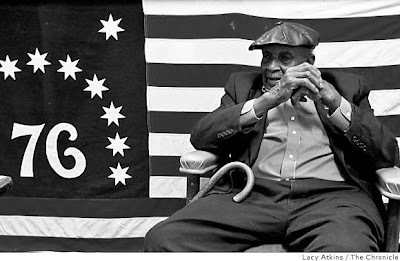 Ulyssies Moore, 92, has waited his entire life for this election. "I never in my lifetime thought I would live long enough to see an African American become the president, even to be nominated by a major party," said the former World War II Buffalo soldier as he cast his vote Tuesday. "A soldier's eyes never cries, but my heart cried for joy when I cast my vote for Obama." The world's heart cries for joy. What a moment. Homer's back, voting in Springfield. "With fewer than six hours until voting begins in Dixville Notch, New Hampshire, the national polling picture has cleared up considerably. Barack Obama is on the verge of a victory, perhaps a decisive victory, in the race for the White House. The national polls have all consolidated into a range of roughly Obama +7. That is right about where our model sees the race as well, giving Obama a 6.8 point advantage in its composite of state and national polling. Our model notes, however, that candidates with large leads in the polls have had some tendency to underperform marginally on election day, and so projects an Obama win of 6.0 points tomorrow. Far more important, of course, is the race for 270 electors. It appears almost certain that Obama will capture all of the states won by John Kerry in 2008. Pennsylvania, while certainly having tightened somewhat over the course of the past two weeks, appears to be holding at a margin of about +8 for Obama, with very few remaining undecideds. Obama also appears almost certain to capture Iowa and New Mexico, which were won by Al Gore in 2000. Collectively, these states total 264 electoral votes, leaving Obama just 5 votes shy of a tie and 6 of a win. Obama has any number of states to collect those 5 or 6 votes. In inverse order of difficulty, these include Colorado, Virginia, Nevada, Ohio, Florida, North Carolina, Missouri and Indiana. Obama is the signficant favorite in several of these states; winning any one of them may be fairly difficult for John McCain, but winning all of them at once, as John McCain probably must do, is nearly impossible. McCain's chances, in essence, boil down to the polling being significantly wrong, for such reasons as a Bradley Effect or "Shy Tory" Effect, or extreme complacency among Democratic voters. Our model recognizes that the actual margins of error in polling are much larger than the purported ones, and that when polls are wrong, they are often wrong in the same direction. However, even if these phenomenon are manifest to some extent, it is unlikely that they are worth a full 6-7 points for McCain. Moreover, there are at least as many reasons to think that the polls are understating Obama's support, because of such factors as the cellphone problem, his superior groundgame operation, and the substantial lead that he has built up among early voters. McCain's chances of victory are estimated at 1.9 percent, their lowest total of the year." It is striking to consider, in this paradigm shifting election, that the dirty deeds of the GOP candidate have gotten so little coverage. The sordid Keating 5 history got some coverage before and after the Obama campaign released a video on the subject at KeatingEconomics.com, but the story never got the traction it deserved, especially in the context of the economic meltdown. Then there was the pesky revelation that McCain had Iran Contra ties. Yet to be questioned (to my knowledge) is McCain’s “heroic duty” in Vietnam, where he participated in an air war that blanket bombed North Vietnam. The Obama campaign apparently decided not to confront McCain's misdeeds, perhaps determining that it would hurt the campaign more than it helped. Considering the nearly flawless conduct of the Obama campaign, I can only guess they made the right call. Still, it is troubling to think that a presidential candidate can avoid facing up to such a record. Huffington Post links to live coverage of Obama talking about his grandmother. Need material to counter the fear mongering in the swing states? This new Obama site has all the documentation you need to counter each specific attack. Bill Clinton came out to rally with Obama last night and addressed the GOP's smear of the week - "Don't tell me about redistribution... What Senator Obama has is a plan that works from the bottom up." These are good rational arguments, but when reality and the ridiculous get so confused, I turn to Jon Stewart, and today I'll add Stephen Colbert, for their ability to boil the news down to its essence. See the previous post. 5 days to go - Get Serious! Jon Stewart interviewed Obama last night. But isn't he a socialist? Colbert didn't stop there. He invited the Socialist Party candidate for President to the show. All right, so how serious is this? We need your help in Ohio. Go to Neighbor to Neighbor. Here you can choose who and where you want to call. Choose your battleground state campaign! Call voters in Ohio, New Mexico, Nevada, Iowa, Florida, North Carolina, Colorado, Oregon, Virginia and West Virginia. Need information to persuade a voter? – go to Makeohiocount.org and choose an article or video from the archive. There is something for everyone there – you will find endorsements from conservatives, Republicans, Catholics, Rabbis , Chicago Jews, Rednecks4 Obama, labor, nobel prize winners, news organizations. Reports of early voting show very low student turnout. Check out the next video, personalize it here with your friends' names and send it to all your friends and student voters in the swing states. Please pass the word to all your friends in the Blue States. We haven't won yet. 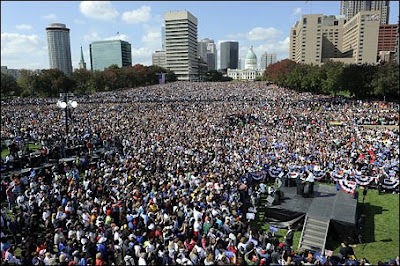 Obama will win if we get everyone out to vote. We need your help to make it happen. Here are the action links for your letter. "Upon arriving at the Hamilton County Board of Elections in Cincinnati to vote early today I happened upon some friends of my mother's — three small, elderly Jewish women. They were quite upset as they were being refused admitance to the polling location due to their Obama T-Shirts, hats and buttons. 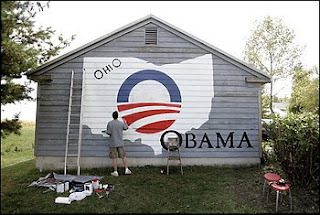 Apparently you cannot wear Obama/McCain gear into polling locations here in Ohio.... They were practically on the verge of tears. After a minute or two of this a huge man (6'5", 300 lbs easy) wearing a Dale Earnhardt jacket and Bengal's baseball cap left the voting line, came up to us and introduced himself as Mike. He told us he had overheard our conversation and asked if the ladies would like to borrow his jacket to put over their t-shirts so they could go in and vote. The ladies quickly agreed. As long as I live I will never forget the image of these 80-plus-year-old Jewish ladies walking into the polling location wearing a huge Dale Earnhardt racing jacket that came over their hands and down to their knees! Mike patiently waited for each woman to cast their vote, accepted their many thanks and then got back in line (I saved him a place while he was helping out the ladies). When Mike got back in line I asked him if he was an Obama supporter. He said that he was not, but that he couldn't stand to see those ladies so upset. I thanked him for being a gentleman in a time of bitter partisanship and wished him well. After I voted I walked out to the street to find my mother's friends surrouding our new friend Mike — they were laughing and having a great time. I joined them and soon learned that Mike had changed his mind in the polling booth and ended up voting for Obama. When I asked him why he changed his mind at the last minute, he explained that while he was waiting for his jacket he got into a conversation with one of the ladies who had explained how the Jewish community, and she, had worked side by side with the black community during the civil rights movements of the '60s, and that this vote was the culmination of those personal and community efforts so many years ago. That this election for her was more than just a vote ... but a chance at history. Mike looked at me and said, "Obama's going to win, and I didn't want to tell my grandchildren some day that I had an opportunity to vote for the first black president, but I missed my chance at history and voted for the other guy." Meanwhile, all us fake Americans better get out there and win some votes! Powell's seven minute endorsement covered a point avoided by liberals and conservatives alike - what if Obama was a Muslim as some Republicans repeatedly charge? Would that be un-American or cast him in cahoots with terrorists? “Well, the correct answer is, he is not a Muslim, he’s a Christian, he’s always been a Christian,” said Powell. “But the really right answer is, what if he is?," said Powell. "Is there something wrong with being a Muslim in this country? The answer's no, that's not America." Colin Powell's endorsement today adds muscle to the growing conservative chorus for Obama. President Eisenhower’s words in his televised farewell to the nation seem even more prescient today than they did last February when his granddaughter, Susan Eisenhower, reprised them for her pre-nomination endorsement of Barack Obama. "As we peer into society's future, we must avoid the impulse to live only for today, plundering, for our own ease and convenience, the precious resources of tomorrow. We cannot mortgage the material assets of our grandchildren without risking the loss also of their political and spiritual heritage. We want democracy to survive for all generations to come, not to become the insolvent phantom of tomorrow." “Today we are engaged in a debate about these very issues," said Susan Eisenhower. “I am not alone in worrying that my generation will fail to do what my grandfather's did so well: Leave America a better, stronger place than the one it found.” In the spirit of the crossover voters who were inspired by Ike’s “pledge to bring change to Washington and by the prospect that he would unify the nation”, his granddaughter, a lifelong Republican, pledged to work to get Obama elected. Susan Eisenhower’s was the first, to my knowledge, of what has become a flood of endorsements and/or defections by conservatives and Republicans. "Barack Obama is not my ideal candidate for president. (In fact, I made the maximum donation to John McCain during the primaries, when there was still hope he might come to his senses.) But I now see that Obama is almost the ideal candidate for this moment in American history. I disagree with him on many issues. But those don’t matter as much as what Obama offers, which is a deeply conservative view of the world. Nobody can read Obama’s books or listen to him speak without realizing that this is a thoughtful, pragmatic, and prudent man. It gives me comfort just to think that after eight years of George W. Bush we will have a president who has actually read the Federalist Papers. Most important, Obama will be a realist. I doubt he will taunt Russia, as McCain has, at the very moment when our national interest requires it as an ally. The crucial distinction in my mind is that, unlike John McCain, I am convinced he will not impulsively take us into another war unless American national interests are directly threatened. “Every great cause,” Eric Hoffer wrote, “begins as a movement, becomes a business, and eventually degenerates into a racket.” As a cause, conservatism may be dead. But as a stance, as a way of making judgments in a complex and difficult world, I believe it is very much alive in the instincts and predispositions of a liberal named Barack Obama." “Many Americans say they're uneasy about Obama. He's pretty new to them. We can provide some assurance. 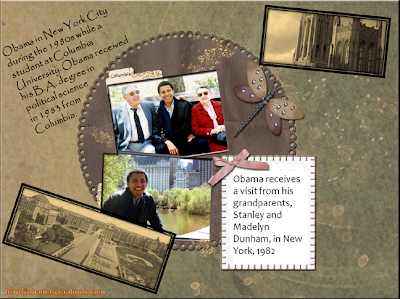 We have known Obama since he entered politics a dozen years ago. We have watched him, worked with him, argued with him as he rose from an effective state senator to an inspiring U.S. senator to the Democratic Party's nominee for president. "We have tremendous confidence in his intellectual rigor, his moral compass and his ability to make sound, thoughtful, careful decisions. He is ready." "It may have seemed audacious for Obama to start his campaign in Springfield, invoking Lincoln. We think, given the opportunity to hold this nation's most powerful office, he will prove it wasn't so audacious after all. We are proud to add Barack Obama's name to Lincoln's in the list of people the Tribune has endorsed for president of the United States." Look for more endorsements from Conservative and Republicans in the days to come in the section at the left titled "Conservative voices for Obama". Washington Post - "All I can say is, wow," said Obama, surveying the sea of supporters who turned out in Missouri, known as the bellwether state. Be sure to note what they say about Palin's assertion that she did nothing wrong in the Troopergate case. 19 days to go - Watch these for extra fuel to Make Ohio Count. Looking for a debate wrap-up? - check the special section on the left side of the page. This is a good piece to send to undecided voters - excerpts below or full editorial. COME JANUARY, a new president will take charge of a nation diminished, an America that is far shakier economically, less secure militarily, and less respected internationally than it was eight years before. The nation needs a chief executive who has the temperament and the nerves to shepherd Americans through what promises to be a grueling period — and who has the vision to restore this country to its place of leadership in the world. ...the way Obama has run his campaign has been a marvel of sound management: He laid down principles, put the right people in positions of authority, and spent money strategically. And he has shown a remarkable steadiness. Whether he was far behind Hillary Clinton before the Iowa caucuses or on the verge of locking up the Democratic nomination, whether he was leading or trailing McCain in the general election contest, Obama made the same forward-looking appeal to voters’ best instincts. As the first black major-party presidential nominee, Obama has strived to make voters comfortable with a ‘‘skinny kid with a funny name.’’ And yet the historical significance of his bid is impossible to ignore. Voters can make no more powerful statement about America’s commitment to inclusion and opportunity than to put forward this man — Barack Hussein Obama, son of a father from Kenya and a mother from Kansas — as the nation’s representative to the world. An early Obama campaign slogan declared, ‘‘We are the ones we’ve been waiting for.’’ His critics deemed such rhetoric too ethereal. Now it seems prescient, as the nation confronts a financial crisis of historic proportions, as well as all the other policy failures and debt-fueled excesses of the last eight years. The United States has to dig itself out. Barack Obama is the one to lead the way. For more video on the Great Schlep, go to CNN. The New Yorker endorsed Barack Obama in a beautifully written piece. American Prayer - ode to unity, not to be missed. For more serious analysis, consider this letter to the editor of the NY Times from the prosecutor in the 1970's case against Ayres. Or, the original article in the NYTimes. The San Francisco Chronicle covered thinly veiled racism in the attacks on Obama and critics concern that hostile McCain/Palin rallies could incite violence. The real expose of the week came from the Obama campaign - If you missed it, watch KeatingEconomics. The Miami Herald covered the Keating 5 story and McCain's connection to Iran Contra. And a group called Velvet Revolution is airing their interview of Stephen Spoonamore, a Republican cyber security expert/whistle-blower who is convinced that the 2000 and 2004 elections were stolen by a MIM, man in the middle. Further, they cover the little exposed subpoena of Michael Connell, the GOP’s top computer expert, to testify under oath in an Ohio federal lawsuit looking into allegations that Karl Rove has directed illegal manipulation of elections through the use of computer technology. Rather than cooperate in the investigation, Connell hired attorneys close to the Bush/Cheney Administration and refused to appear for the deposition arguing client (GOP) confidentiality. McCain on War in Iraq - quote of note from Pat Buchanan - "He will make Cheney look like Gandhi". McCain on War in Iraq 2 - if you can stand to punish yourself with two of these. Quote of note comes at the end of this one. "I disagree with what the majority of the American people want." John McCain. Obama leading in Ohio by 6 pts. Aided by the faltering economy, Democratic presidential candidate Barack Obama has a six point lead in the race for Ohio, according to a new Washington Post-ABC News poll, putting Republican John McCain at a disadvantage in a state considered vital to his chances of winning the White House in November. Uh-oh...Ayers won't work anymore (There goes the kitchen sink, I guess here comes the table)...Some republicans from Chicago are saying what most of us knew all along. Bill Ayers was a commonly acceptable figure in Chicago by everyone--Democrats, Independents, and even Republicans. Are they all America hating, terrorist loving traitors to America?! "It was never a concern by any of us in the Chicago school reform movement that he had led a fugitive life years earlier," said former Illinois state Republican Rep. Diana Nelson, who worked with both Obama and Ayers over the years. "It's ridiculous. There is no reason at all to smear Barack Obama with this association." "The Obama campaign says he first met Ayers in 1995, when Obama became chair of the board of the Chicago Annenberg Challenge, a $50 million fund that awarded grants to groups trying to implement new programs to improve inner city education in Chicago. Walter Annenberg, a lifelong Republican and former ambassador who was appointed by Presidents Nixon and Reagan, funded an ambitious program to reform urban education in many cities in the mid 1990s. Ayers was an important member of the group that developed and wrote the grant proposal to the Annenberg Foundation." Second, there were people of all political persuasions working on this effort with this "terrorist" Ayers and who saw him as acceptable and Obama was no closer than any of the others. "...no one on the board or on the Annenberg Challenge staff remembers Obama being any closer to Ayers than to any other member of the board. The Annenberg board also included several civic, business and education leaders, many of them Republicans..."
"I don't remember ever hearing anyone raise concerns or questions or concerns about [Ayers'] background," says Anne Hallett, who has worked closely with Ayers on the Annenberg Challenge grant and with Obama on education and other community and legislative matters. "And that included everybody I was engaged with," including prominent Republicans, and corporate and civic leaders in Chicago, Hallett adds. Hallett calls this attack on Obama's association with Ayers and the Annenberg Challenge by further association, "a smear campaign. It's a political diatribe that has no basis in fact. The Chicago Annenberg Challenge was an extremely positive initiative. It was well-vetted, thorough, and the fact that it is now is being used for political purposes is, in my opinion, outrageous." McCain - Maverick, crusader against corruption? KeatingEconomics.com , a new site funded by the Obama campaign, exposes McCain's leading role in the 1980’s Keating 5 scandal. Testimony by a former federal bank regulator involved in the Lincoln Savings and Loan case forms the backbone of a documentary which is nothing less than a devastating indictment of the GOP presidential candidate. “Fraud is the creation of trust and then its betrayal.” – William Black, PhD, former federal banking regulator. Intervention by the Keating 5 caused a two year regulatory delay – two years that allowed Keating to continue to bilk elderly investors who, with Lincoln’s encouragement, invested $250 million dollars in high risk bonds. The bonds defaulted, Lincoln collapsed and more than 20,000 people lost their savings, at a cost to taxpayers of 3.4 billion dollars. The wider government bail-out of the savings and loan industry cost tax-payers 153 billion dollars by 1999, according to a FDIC report. What did McCain know about Keating and Lincoln Savings? So testifies the regulator who was there, William Black. KeatingEconomics.com lists several background articles, but the video is the most damning document of all, in part due to Black’s intimate involvement in the case. George Will - Can a dismaying temperment be fixed? The Great Schlep featuring Sarah Silverman - R rated! For youth only.